The Economic and Financial Crimes Commission has set up a special team to interrogate Governor Ayodele Fayose of Ekiti State. Fayose, who has been governor since October 16, 2014, will lose his immunity at exactly 11.59pm on October 15, 2018, thereby giving the EFCC the constitutional right to arrest, detain and prosecute him. The governor is expected to report at the EFCC head office in Abuja to meet with the commission’s Director of Operations, Umar Mohammed, after which he will be grilled by a team of operatives, The Punch gathered. Fayose is under investigation for allegedly receiving over N1.2bn from a former National Security Adviser, Col. Sambo Dasuki (retd. ), through a former Minister of State for Defence, Senator Musiliu Obanikoro. 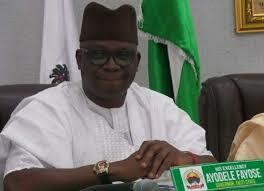 The money was allegedly handed over to Fayose during the build-up to the 2014 governorship election in Ekiti State. Fayose’s aide, Abiodun Agbele, and others had been arraigned by the EFCC but Fayose was excluded because of his immunity. A source within the EFCC said, “We are expecting Fayose to show up at our office next week. He has nowhere to run to since he is under security watch and cannot leave the country through any land border, seaport or airport. Apart from the alleged N1.2bn fraud, the governor is also under probe for alleged contract fraud. Fayose is expected to be arraigned after investigations.